Great work! I've got that loaded up and will keep an eye on the real-time info. The two Cloud Maps don't quite line up - it seems that the "Global Cloud Map by C. Parsons" puts the clouds closer to the equator than the "Global Cloud Map". Do you know what's going on here? By the way, I have been involved in creating an online community to share information about scientific uses of geobrowsing tools like Google Earth: http://www.scispace.net/geobrowsers. I have linked this blog post from there (hope that's OK!) and perhaps readers of this blog who are interested in environmental science would like to check out our community and perhaps join. 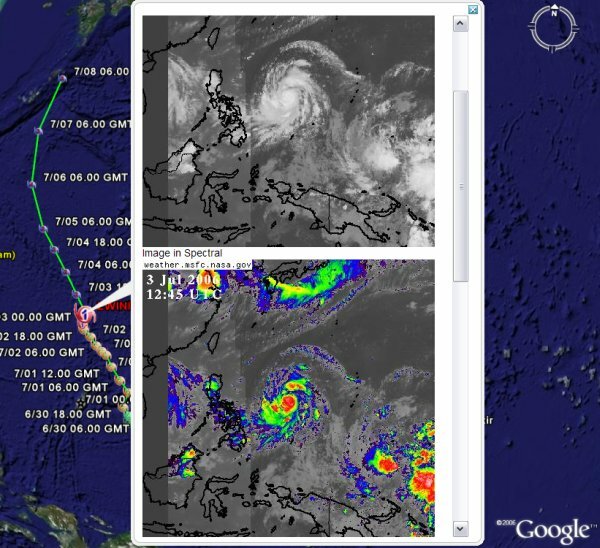 I found some additional Google Earth weather content from looking through google's mapplet (maps.google.com/preview) stuff. The site is www.guiweather.com and they have real-time lightning data, radar, watches and warnings....there's a promise of some tropical stuff coming...we'll see. The radar looks really good and clean...not much clutter and has an animation. The lightning data is global too...first time I've seen that.